The Repose of Nobleborn Princes Vasilii and Konstantin Vsevolodovich of Yaroslavsk: In their youth they lost their father, Vsevolod, who fell in battle with the Tatars (Mongols). 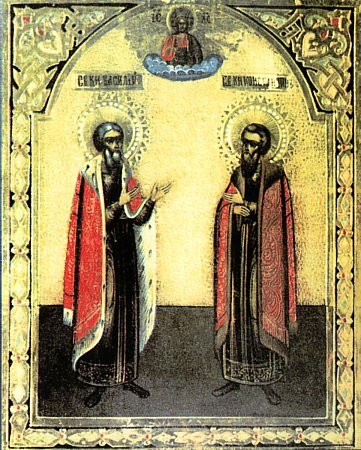 Saint Vasilii, the elder brother, succeeded to the throne. A multitude of concerns, tasks and sorrows beset him as prince. The city and the villages were devastated from the invasion of the Tatars, many households remained without shelter and food, and he had to concern himself about everything and about everyone. Besides this, it was necessary to gain the good-will of the Tatar khan, and the holy prince more than once made journey for this reason to the Horde. He suffered also a family misfortune – the loss of his only son. All his tribulations the holy prince suffered without complaint, and he ruled the princedom, like a true Christian: he did not enter into disputes with other princes, he concerned himself over the misfortunate among his subjects, and he built churches. But soon his life, filled with many sorrows, exhausted the strength of the prince, and he took sick and died in the year 1249. After him holy Prince Konstantin succeeded to the throne. He strove to imitate his brother, but to his great dismay, everywhere he saw pillage and murdering done by the Tatars. In 1257 the Tatars fell upon Yaroslavl' itself. The prince came out to fight the enemy, but here in this battle he gave up his life for his country. In the year 1501 the relics of the holy princes were uncovered undecayed and now rest in the Yaroslavsk cathedral.